Truffles can drive people to do funny things. Moliere’s 1664 Tartuffe, a farce about fraud, may not actually explain an iota of trufflemania. The word ‘truffle’ is an esteemed word, uttered almost religiously except to those who are suspicious of its devotees and only see the earthy truffle as an over-rated delicacy for histrionic food hypocrites. What glandular nexus of the olfactory lobe is missing from their brains I will never know. 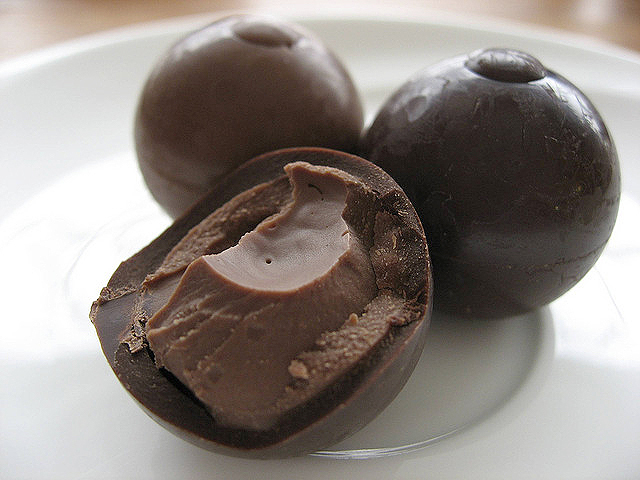 Those who only know the chocolate “truffle” have little idea this is a modern candy surrogate for the real thing. As hypogeous fungi growing underground in the dark in a widespread global phytogeography, forming symbioses with the roots of host trees and plants via ectomycorrhizae, truffles have enriched our knowledge as well as palates with their rich historic fare throughout ethnobotanical history. It was the peerless French gastronome Brillat-Savarin who said, “whoever says ‘Truffle’ utters a great word”,  and his 1825 tome is a good place to start, although trufflemania goes back millennia. A few years ago in Northern Italy, my Sardinian friend Roberto drove 200 kilometers at breakneck speed in his racy Alfa Romeo from Gran San Bernardo in the Alps high above Val d’Aosta. 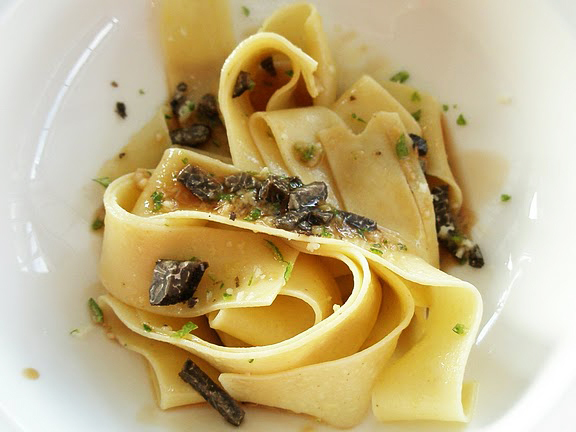 With my teenage daughter Beatrice, we were on our way to one of the best truffle restaurants in Piemonte for a legendary tagliatelle con salsa cremosa al tartufo bianco. Tires screeching on every steep turn, we made it to the restaurant southeast of Torino in little more than an hour, the needle often well past 185 kmh on the autostrada with me clinging with one hand to my leather seat and the other in the brace position. When I mentioned being possibly pulled over – in part hoping to slow him down – Roberto laughed at the thought of anyone challenging him. This was because he was a high officer of one of the national polizia. Looking back, I admit I was salivating over the dinner but was concerned about my fifteen year-old daughter in the back seat of the sporty car as the blurry landscape zipped by. Racing down the mountains she would frequently squeal in what I rationalized as adolescent spleen over our speed. Dinner was certainly worth the angst for me, I don’t know if Beatrice agreed. A few years later, she now loves truffles too, so I hope she discovered then and there that trufflemania may even be genetic and indulgently forgave her father. My birthday presents from her lately have been sel aux truffes and beurre de truffe, just compensation as I add vintage. 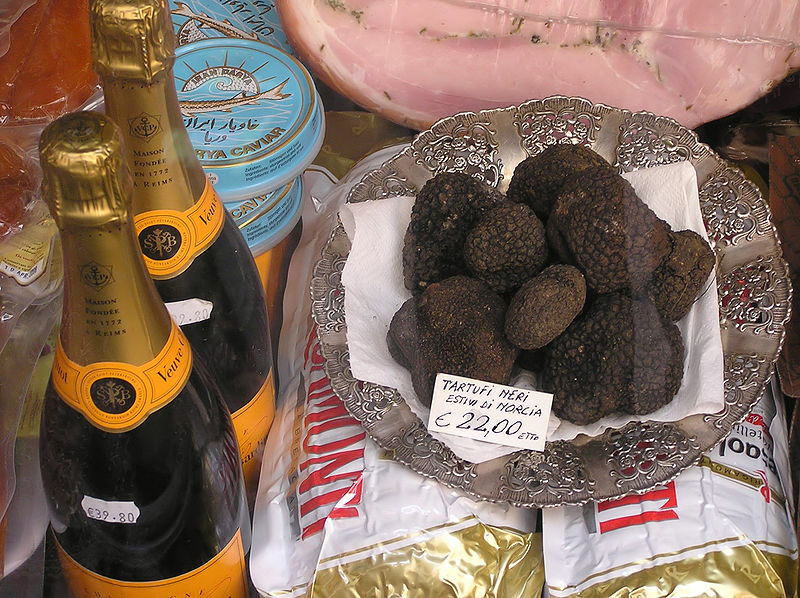 Venerable truffle traditions like this one, while interrupted for the medieval centuries, hark back at least to Sumer in Early Bronze Age Mesopotamia. 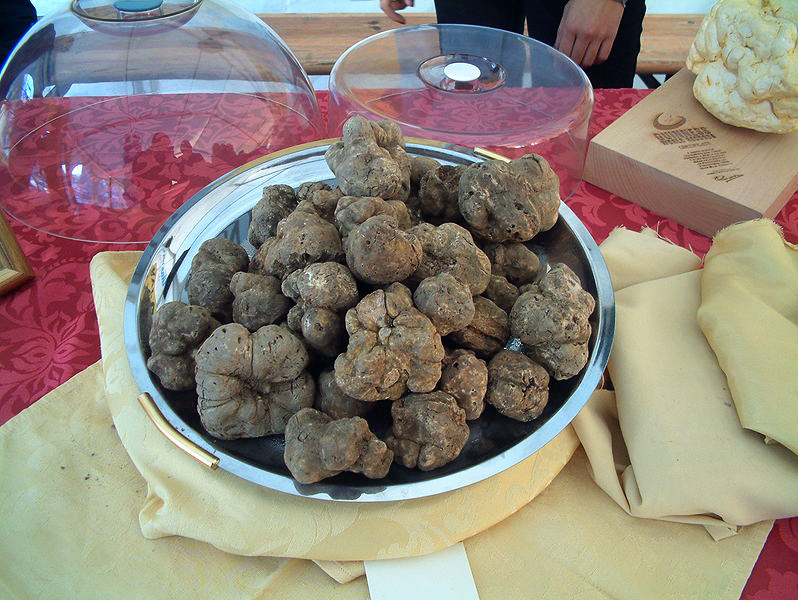 In Greek and Roman times alone, truffles and other fungi were certainly appreciated as gourmet food. Any association with thunder is apropos in warm Mediterranean climes since this phenomenon is usually auspicious of a good drenching, necessary to soak the soil and the truffle spores therein. Pliny also claims the best truffles in Greece come from Elis, also fitting since this well-watered locus is also the site of Olympia, sacred sanctuary of Zeus, thrower of thunderbolts. also suggesting it would be better for the grain harvest to fail than the truffle harvest to perish. Accepting it as fact, Plutarch likewise also asks why thunderstorms are conducive to truffles. These several links to Jupiter, chief of Olympian Gods are only right since the divine truffle is to many the king of food, definitely preferred over choice North African wheat, generally among the best in the Roman world. 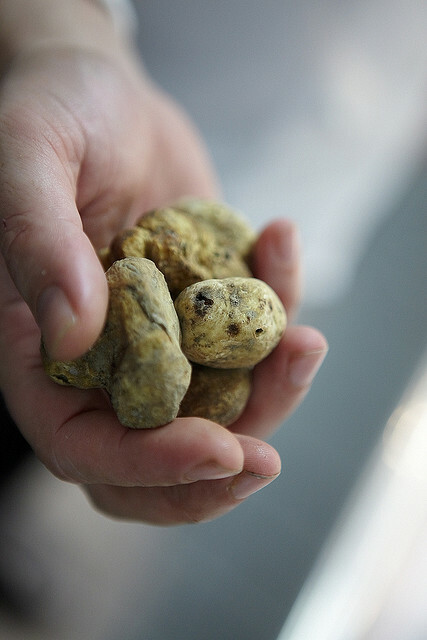 Who even needs fresh bread when fragrant truffles can be consumed with due reverence? Classical tradition often shows how much the Romans loved mushrooms (Basidiomycetes) as well as truffles (Ascomycetes). The Latin word boletus can be – but is not necessarily limited to – the modern cèpe in French or porcini in Italian. It’s amusing that American supermarkets offer both cèpe and porcini in the same dried packaged mushroom section to guarantee snagging buyers of either edible fungus. Roman writers including Pliny, Plautus, Tacitus, Juvenal and Martial all discuss the boletus, usually taxonomically referring to Boletus edulis while the Latin tuber terrae (also tufera) for “truffle” appear in Pliny’s prose, Juvenal’s and Martial’s poems and epigrams (e.g Epigram 13.50) and the expected cookbooks of Apicius; all of these writers laud the tasty virtues of truffles and boletes. Mosaics and Pompeian wall paintings also depict favorite edible Roman mushrooms. Yet the phytogeography and ethnobotany of truffles and their cousins are not limited to Europe. Not only have the more familiar dark French truffles (Tuber melanosporum) long been called the “Black Diamond” of the Périgord, but truffles also have a fame going back nearly 4,100 years to Sumer in Ancient Mesopotamia  and including at Mari, roughly 1900 BC. Some scholars like mycologists Shavit and Volk have even suggested the Negev desert truffles (Terfezia pfeilii, a.k.a. Kalaharituber pfeilii) normally appearing after spring rain were the miracle of “manna” rising from the ground to feed early Israel in their wilderness wanderings in Exodus 16:14, flavorfully and perhaps with a flavor similar to coriander. Manna in Hebrew essentially meant “What is it?” and it might have been easily mistaken in legend as it is now in fact for a small brown desert rock at first sight. The connections Shavit and Volk raise are intriguing because both manna and desert truffle are “small and round” and found “on or in the ground.” Only right that philology meets mycophily for those of us inclined to both. Nor should it be a surprise to anyone knowledgeable in the Middle East that some of Islam’s holiest literature also refer to the desert truffle as manna and its juice a good medicine for eye maladies as narrated in certain Ahadith of Mohammed. Shavit even relates an account from Ludovico di Varthema, the intrepid Renaissance Italian traveler in the Near East, who reported witnessing caravans of 25 or more loaded camels, sacks filled with desert truffles plodding to Damascus. Why does this make one think of the Magi with their precious gifts? Why not truffle alongside gold, frankincense and myrrh? Moving back to the remembered almost present à la Proust, I count myself fortunate to be invited in summer or autumn to go truffle-hunting (Tuber aestivum) with Burgundian friends who are also wine producers of excellent premier cru Vosne-Romanée. In this case dog noses are in demand! In the same village I know another family, including a boutique champagne producer from Epernay who also has the most marvelous and enviable sense of smell for mushrooms, however remote or miniscule they may be. From favorite Saturday morning markets in Chamonix, Annecy and Beaune and en route to Paris, I had purchased more than a few charcuterie items along the way. But I knew I couldn’t smuggle them back home past the long-nosed customs dachshunds and beagles. These included viandes filed with tasty morsels making them look like treasured Renaissance breccia marbles: saucissse de Beaufort (French alpine cousin of Gruyere cheese), saucisse de cepe (mushroom), saucisse de sanglier (wild boar) and others. I stopped as usual in Vosne-Romanée to visit these vigneron friends. We were sharing food and their Grand Cru wines from the domaine cellars – especially salubrious Grands-Échezeaux 1996 and 2002 – and I had contributed my share of saucisses happily paired with their domaine wines. This champagne producteur was the son of my friend, Marie-Therèse Noellat, the grande dame of Domaine Georges Noellat, down from Epernay for the weekend to visit family. Solely by holding each paper-wrapped saucisse to his prominent nose, he could immediately tell from the fragrance what type was inside. His face especially lit up with the saucisse de cepe, which he pronounced with a sigh as having been just the right season when the meat was matured. If my nose had been as refined over the familial centuries– and maybe as grandly sized – as a champagne producteur, perhaps I would be in the wine business instead of being a peripatetic academic. Not all fungi have been eaten merely for taste and gustatory effect by our possibly gourmand-or-not ancestors who roamed Europe tasting just about every kind of plant or root when thick forests stretched from Brittany to Warsaw. In the alpine Neolithic, we now surmise “Ötzi” the Iceman from 5,300 years ago carried bracket fungus for a different reason in his frozen kit when discovered in a melting glacier in 1991 by climbers in the Ötztal Alps high above the Tyrol between Italy and Austria. “Ötzi” most likely carried broken bracket fungus (Basidiomycetes) threaded on a thong – in this case Piptoporus betulinus or birch polypore – that he could chew and swallow as a vermifuge for his intestinal parasites (preserved whipworm Trichuris trichuria), a known common malady and diagnosed “pharmaceutic” remedy traceable in this case to the dawn of civilization, also possessing anti-inflammatory and antibacterial use. The parasites either found the fungus toxic or it worked as a quick emetic as chewing it probably didn’t go down so well in the Neolithic stomach either. How that particular medicinal remedy came about combating nasty worms with nastier bracket fungus can only be from millennia of scouring woodlands in human experimentation and observation. Naturally, old cultures tend to also have a long memory of such fungal remedies. Even now if you visit any Chinese herbalist with hundreds of apothecary-like antiquarian glass jars filled with unrecognizable dried mysteries, age-old remedies include another famous bracket fungus, lingzhi in Chinese (named Ganoderma lucidum in taxonomy). Lingzhi has long been considered an efficacious polypore since at least the Han Dynasty, perceived as beneficial to human longevity and health in various ways, possibly including lowering blood pressure, reducing cholesterol and also as anticarcinogenic, although the taxonomy of lingzhi is apparently complex. Good health and good taste may or may not be combatants, since many edible fungi are known to have a fair share of good nutrients and amino acids without the arteriosclerotic effects of red meat. On the other hand, still nothing fungal beats a truffle for sheer gastronomic ecstasy. How long we truffle hunters have searched for truffles and other edible or medicinal fungi is anyone’s guess. Maybe the early modern humans of 25,000 years ago (previously called Cro Magnon from that eponymous rock shelter) deep in the Périgord dug their truffles out of the leafy forest floors in between painting other comestibles like smoked venison in flight across the cave walls at Lascaux and Les Eyzies. It seems brain capacity hasn’t changed that much in the interim if we can be instantly transported from deep abstractions on quantum mechanics to crazed behavior by one profound smell in a flash of seconds. Perhaps mycophilia and mycophobia and the like are relegated to olfactory instincts based on attenuated gene pools. Now after sufficient instinct memory through thousands of years, perhaps either you have the truffle-loving gene or you don’t. 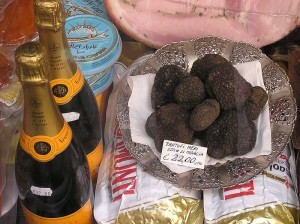 That just makes more for those of us who, like the ancients, remain blessed with the divine affliction of trufflemania. Jean Anthelme Brillat-Savarin. The Physiology of Taste: Or, Meditations on Transcendental Gastronomy. Penguin Classics, 1994, 90 & 93: “the truffle is not a positive aphrodisiac; but it can, in certain situations, make women tenderer and men more agreeable.” Another useful text is Maguelonne Toussaint-Samat. A History of Food, Wiley-Blackwell, 1994, 434-5 ff; for Classicists, A. H. R. Buller. “The Fungus Lore of the Greeks and Romans.” Transactions of the British Mycological Society 5 (1914-1916) 47-8. Dan Dorfman. “Trufflemania Extends to the $200 Baked Potato”. New York: The Sun, October 4, 2006. In Dorfman’s article, restauranteurs state: “some customers go crazy” and “…they just can’t seem to wait…” Good descriptions for this ailment called trufflemania. Richard Vines. “[Sir] Stanley Ho Pays Top Price at $417,000 Truffle sale for Charity.” Bloomberg News, Nov. 27, 2010. Theophrastus, Historia Plantarum I.6.9 [h]udnon ([h]udna in the plural). Also see Werner Winter. “Two Greek Words for the Truffle,” American Journal of Philology 72.1 (1951) 63-68; R. Sharples and D. Minter, “Theophrastus on Fungi: Inaccurate Citations in Athenaeus” Journal of Hellenic Studies 103 (1983) 154-6 with all the complications of misreadings of Athenaeus on Theophrastus: “” Both of these modern commentaries point the philological Greek connection between the truffle (geraneion) and sow (grôna). Pliny, Natural History XIX.13.1. Elsewhere in NH XXV.9.67.115 Pliny mentions tuber terrae or “earth tuber” for truffle. Plutarch, Moralia VIII “Table Talk” 4 Quaestione 2; P. A. Clement, H. A. Hoffleit, trs./eds. Plutarch: Moralia VIII.1-6, Harvard Loeb Classical Library, 1969, 316ff; R. Gordon Wasson, Stella Kramrisch, Carl A.P. Ruck and Jonathan Ott. Persephone’s Quest: Entheogens and the Origins of Religion. Yale University Press, 1992, 84. Apicius, De Re Coquinaria VII, Epimeles II.27; Polyteles “Sumptuous Dishes, Chapter XVI.315. Patrick Hunt. “Nero” in Notorious Lives: Great Lives in History. Salem Press, 2007. Seneca Apocolocyntosis 4 suggests Claudius “expired, moreover, while listening to comic actors”, not quickly at the dinner table. V. J. Marmion and T. E. J. Wiedemann. “The Death of Claudius.” Journal of the Royal Society of Medicine 95.5 (2002) 260-1. XVI. Tacitus. Annals XII.66-67. Tacitus relates that Agrippina used a convicted woman poisoner named Locusta for the deadly concoction and that the mushroom in the dish was an “exceptionally fine” one. Wilhelmina M. F. Jashemski, Frederick Meyer and Massimo Ricciardi. The Natural History of Pompeii. Cambridge University Press, 2002, §99, 128, fig. 111. Jean Bottéro. “The Cuisine of Ancient Mesopotamia.” The Biblical Archeologist 48.1 (1985) 36–47. Elinoar Shavit. “Truffles Roasting in the Evening Fires” Fungi 1.3 (2008) 18-23. Shavit quotes Addu, governor of Saggaratum to Zimri-Lim, king of Mari, c. 1770 BC. Elinoar Shavit and Thomas J. Volk. “Terfezia and Tirmania. Desert Truffles (terfez, kama, p/faqa): Delicacies in the Sand or Manna from Heaven?” BotitBotany. University of Wisconsin-La Crosse. (January 2007). A word in biblical Hebrew sometimes used for truffle is paqa, which Volk and Shavit also connect to the Elisha passage in II Kings 4:39-42. Volk is a mycologist in the Biology Department of University of Wisconsin-La Crosse. http://botit.botany.wisc.edu/toms_fungi/jan2007.html. “Sa’id bin Zaid…reported: I heard Allah’s Apostle (Sallallaho Alaihi Wassallum) as saying: Truffles are a kind of ‘Manna’ and their juice is a medicine for the eyes,” cited in Sarfaraz Khan Marwat, Mir Ajab Khan, Muhammad Aslam Khan, Mushtaq Ahmad, Muhammad Zafar, Fazal-ur-Rehman and Shazia Sultana. “Vegetables Mentioned in the Holy Qura’n and Ahadith and Their Ethnomedicinal Studies in Dera Ismail Khan, N.W.F.P., Pakistan.” Pakistan Journal of Nutrition 8.5 (2009) 531. Shavit (2008), 20, cites George Badger, ed. The Travels of Ludovico di Varthema. London: The Hakluyt Society, 1863. This is reprinted as The Travels of Ludovico di Varthema. Elibron Classics, Adamant, 2001, 15 where in Chpater 3 footnote 2, Badger also gives the Arabic word kama for desert truffle. Luigi Capasso. “5300 years ago, the Ice Man used natural laxatives and antibiotics.” Lancet 352  (1998) 1864; Luigi Capasso. “Laxatives and the Ice Man”. Lancet 353  (1999) 926. B. Schlegel, U. Luhmann, A. Härtl, U. Gräfe. “Piptamine, a new antibiotic produced by Piptoporus betulinus Lu 9-1.” Journal of Antibiotics (Tokyo) 53  (2000): 973–4; H. V. Wangun, A. Berg, W. Hertel, A. E. Nkengfack, C. Hertweck. “Anti-inflammatory and anti-hyaluronate lyase activities of lanostanoids from Piptoporus betulinus.”, Journal of Antibiotics (Tokyo) (Germany) 57  (2004): 755–8. R. S. Hseu, H. H. Wang, H. F. Wang and J. M. Moncalvo. “Differentiation and grouping of isolates of the Ganoderma lucidum complex by random amplified polymorphic DNA-PCR compared with grouping on the basis of internal transcribed spacer sequences.” Applied and Environmental Microbiology 62.4 (1996) 1354–1363.